Don’t despair! Looks aren’t everything, and you won’t even see the cake under the icing. I am sure it tastes great. Practice makes perfect…..Working on my baking was a goal a few years ago and it has gotten MUCH better. Every now and then, I still have to throw away something that just doesn’t want to cooperate. I learn from all these inedible and imperfect experiments. There is a lot less wiggle room in baking, however, if you can cook, you can successfully bake. I look forward to reading you future posts about how you have whipped this wedding cake thing! I think it takes a while to get into the swing of this baking malarkey and all the variables that can go pear- shaped! I bet it tasted really good though? Quick, cover it in frosting and no one has to know! I am agreeing with everyone above, frost that dude and no one has to know! I bet it does taste good! Nice photos! It is good that you have your science support right with you! Baking is such a science and that is why I have never mastered it! But I am sure you will! That’s what frosting is there for! It’s all about the way it tastes. How frustrating! It looks like it’s a reasonable texture so will taste good – I’m with all those who say slap some frosting on it and nobody will ever know. This months Sainsburys magazine (may 2008) has a gorgous recipe for a decorated wedding cake in it, plus an older but very popular recipe in the supplement of recipes from the last 15 years. Might be worth checking out for decorating ideas if you have a sainsburys near you? I definitely agree about the camo-frosting! I know it might seem like it’s not posh enough for a wedding cake, but truly, it is! Use good butter (unsalted, the most expensive you can find), proper Madagascan vanilla, organic eggs, and it will be fine. It is a very, very easy recipe and I think that’s a good place to start. Also, have you thought of trying round tins? It’s much less likely to break when coming out of a round tin, in my experience. 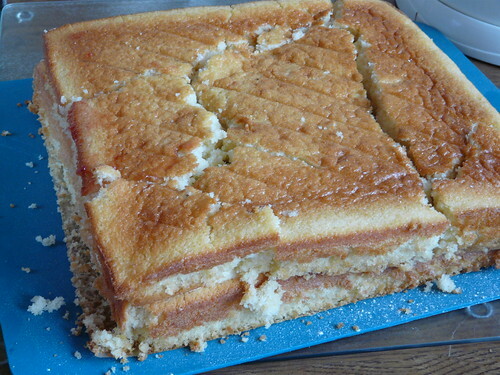 You can even bake the cake in a large round tin and cut it into squares after, if you like. But I would recommend trying a springform, non-stick, preferably round tin, before you go much further. Tunesia – “If you can cook, you can successfully bake” – That’s a reassuring thought. Will make it my mantra. Holler – It does taste really nice actually! Megan – 😀 You made me laugh out loud. Deb – I am determined too. All this support is great! Sylvie – I’ve got it tasting good. Just got to get it looking prettier. Mmm… glad this tasted good and your friends are right about icing hiding a lot of ills. It is crucially important to line your tin and put in enough so that you can lift the cake out (in a cross formation). I do use a springform tin and it does really help. Maybe also just baking one at a time so that you don’t have to open the oven door. I think you need to move onto practice with icing too, as it has a nasty habit of sticking to the surface of the cake and getting all mixed up and you need to get the hang of it. Use a knife in a tall jug of very hot water. Hope this helps. You only get the reward because I won’t even try….. I find cooking for friends is a bit like performance art… When you forget your lines, make them up and no one will notice. well done for a cake that looks very edible! this is pretty obvious but do you leave it in the tin for about 10 minutes when it comes out of the oven? that helps the cake settle a little and more likely to hold together when you take it out of the tin. Can’t help with baking tips. Reckon we could both wear that particular crown. Still, your efforts are improving. And icing fixes EVERY-thing! I’m sorry this is causing you so much heartache as it looks as though it would taste absolutely delicious. Just look at that gorgeous yellowy fluffiness! Do the bride and groom have their hearts set on one big cake, or could you take them down the lucious heap of cupcakes route? Have you looked into any cake-making classes to boost your confidence a bit? Good luck! I’d spread some dulce de leche on top of it, and serve it with ice cream. Yummy! ya know, despite it’s form, it really looks moist and delicious! Sorry to see it isn’t going well Wendy! I have had my fair share of cake disasters, but I suppose the pressure increases when it is for a wedding! You will get there. if I can help just ask. Shona – Oh no! The icing is tricky too???? Johanna – You’d think that was obvious but I got impatient and didn’t let it cool properly. Hence the ugly cake. Aforkfullofspaghetti – It is fun too, must say. Lysy – I’m not seriously worried about it all. I have a get out clause (i.e. the local bakery). But I do like to succeed! Patricia – Just told D that and he’s rushed of to the kitchen to try it out! Linda – Thanks! It was very moist. David – Thank you so much. It’s all good fun and as I said to Lysy I do have a get out clause. Helen – It does seem a bit crazy that I’m trying to make a huge cake when I can’t make a wee one! I wonder too if round cakes would work better? What about cooking 4 x 20 cm round cakes then cutting them into squares and joining then together with the icing into one big square? Jane – Perhaps it would… Can’t believe how complicated this is!